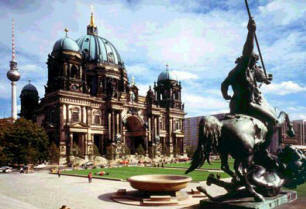 Upon arrival in Berlin, optional private transfer to your hotel. Rest of the day free for own activities. Overnight. Breakfast at the hotel. Board your Hop on and Off city tour bus at the closest stop and visit some Berlin’s attractions, including the Kurfürstendamm, Brandenburg Gate and Potsdam Square, etc. You can get off the bus at any location, then continue your sight seeing later. Breakfast at the hotel, then excursion to the nearby city of Potsdam known for the famous conference that decide the fate of Europe. Enjoy a relaxing and pleasant day in Potsdam. Visit the city’s historic quarter, the Russian settlement of Alexandrowka built by Frederick William the III. for the entertainment of the Russian Czar. The village is now a UNESCO World Heritage site. You can also visit the lively neighborhood of the Dutch quarter with its atmospheric brick houses, cafes and bars. Enjoy a stroll through the beautiful gardens of the Sanssouci Palace and admire this famous building, a UNESCO world heritage site. On the way back you may also see the New Palace, the New Chambers Palace, the historic Windmill, Charlottenhof Castle, the Roman baths, the Orangerie Palace and more. Audio guide inside the palace. Return to Berlin for overnight or continue with your hop on and off tour in Berlin and visit several museums with your museum pass. Breakfast, end of services or optional private transfer to the airport. The City-Circle-Tour hop-on/hop-off bus service with ear-phone guide. You can hop-on and hop-off the buses at 20 different landmarks all around the city. The service runs 7 days a week from 10am to 4pm. If you like you can also stay on the bus for the full two-hour tour. A bus leaves every 10-15 minutes from each hop-on/hop-off point. POTSDAM Excursion- enjoy a relaxing and harmonious journey through cultural, art- and architectural time during our sightseeing tour through Potsdam and see among other sights the historic sections of the city, the Russian Colony “Alexandrowka” and the Dutch Quarter (Holländisches Viertel). Enjoy a walk through marvellous gardens of Sanssouci and see the famous sights like Sanssouci Palace, New Palace, Palace New Chambers, Historic Windmill, Charlottenhof Palace, the Roman Baths, the Orangery Palace and more. Take the opportunity to visit one of the Palaces in Sanssouci gardens or relax in one of the local restaurants. After the break of approx. 2 hours enjoy the return drive to Berlin in our comfortable coach.